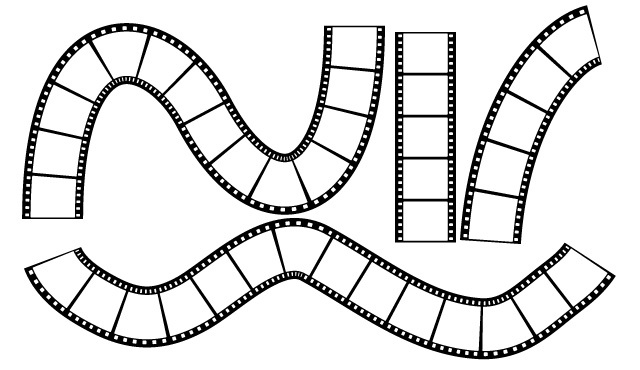 I was making something else and somehow got sidetracked and ended up making a filmstrip brush for Adobe Illustrator. I actually have no use for it, but if you do, please feel free to download and use us as much as you can! To Install: Download the file, open Illustrator, open your brushes palette, choose open brush library, choose other, then find the downloaded file. Draw and select a line and choose the brush from your brushes library and there you go! Vary the stroke for size of the filmstrip (With later versions of Illustrator you can vary the width within one line and it’ll give it a 3D effect). It’s not great on turns, but tweak it and it should be still be useful. If you need turns, feel free to open it up and add to it. It’s free to use and modify as you wish. I hope you get some fun out of it. If you make something cool with it, be sure to let us know! I just downloaded it and tried it. If you open filmstrip.ai, you can go to the brushes palette and there will be the brush in there. Draw a line then click on the filmstrip brush and your line should be transformed. Double click on the brush and you can change the size of the filmstrip. This works on CS5.5, and it should work on other versions. Let me know if you have any troubles with it. Thanks loads! This is exactly what I am looking for! Hey guys! Nice brush! I might use your brush in a figure for scientific paper. How should I acknowledge you or put a reference? Hey cool, glad it’s useful to you. No acknowledgement required, but if you want to somehow say you got the brush from jeffco.ca, that would be kind of neat. THANKS SO MUCH this is exactly what I needed!!!! this is a lifesaver! Thank you!